Two tornados left a path of destruction in eastern Iowa on Saturday night May 25, 2008. The first tornado was rated as an EF 5 with wind speeds up to 205 MPH. The tornado was nearly 3/4s of a mile wide as it moved through the southern end of Parkersburg and grew to near 1.2 miles wide north of Dunkerton leaving 100's of homes and businesses destroyed. This is the first EF5 tornado in Iowa since June 13, 1976. The second tornado, rated as an EF3, moved through Hazelton and ended somewhere near Oneida. The following photos are from the areas around Aurora, Hazelton, Fairbank, and Dunkerton, Iowa. CLICK ON EACH IMAGE TO VIEW A LARGER VERSION. 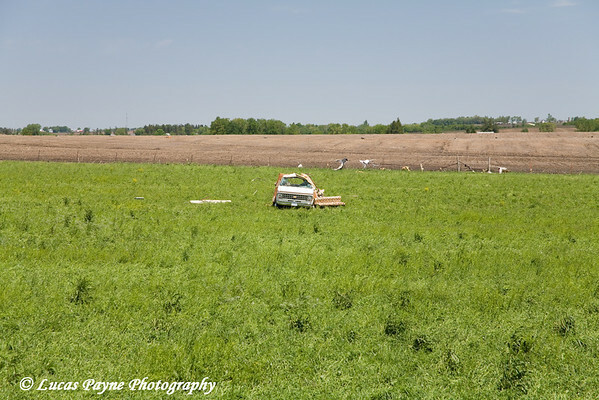 Tornado damage between Aurora and Hazelton, Iowa.